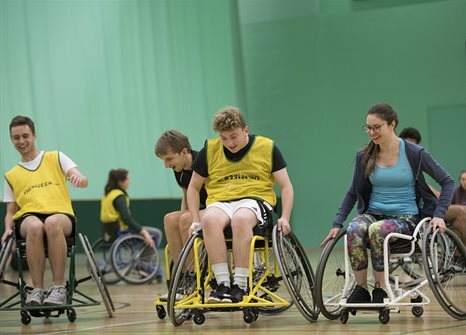 Welcome to the University of Nottingham Wheelchair Basketball (UoNWBB) Club! We are an inclusive, friendly and competitive club for wheelchair basketball players of all standards - from complete beginners to pros in the chair, we offer a postive atmosphere for all to take part. For complete beginners we offer the new 'Engage' programme, aimed at those who want to try out a new sport in a social enviroment. Anyone can come along to these sessions, if you don't have a sports membership you will have to pay a small fee. For the more advanced and competitive players, we offer a club training session. These sessions run drills that are geared towards improving your WBB skill set whist also allowing you to put those skills into practice in a competitve game towards the end of the session. For both sessions, the club provides a range of basketball chairs that cater for players of all sizes. At UoNWBB, we encourage players of all physical abilities to get in the chair and give it a go - whether you have a disability or not, everyone is welcome. See us at Welcome Fair or sign up online. If you want to try it out before committing yourself to the club, look out for upcoming taster sessions on our Facebook group page or come along to an Engage session!